Happy Funny Bone Monday! Today's topic honors the author who spoke to our writer's group yesterday, Joe Schreiber. His latest novel, Star Wars: Death Troopers, just begs me to poke fun at the Star Wars empire. Empire. Heh. You have ever had your R-2 unit use its self-defense electro-shock thingy to get the bar-b-q grill to light..
10. In the Star Wars Universe weapons are rarely, if ever, set on "stun". 9. The Enterprise needs a huge engine room with an anti-matter unit and a crew of 20 just to go into warp -- The Millannium Falcon does the same thing with R2-D2 and a wookie. 8. After resisting the Imperial torture droid and Darth Vader, Princess Leia still looked fresh -- After pithy Cardassian starvation torture, Picard looked like hell. 5. The Death Star doesn't care if a world is "M" class or not. 3. Jabba the Hutt would eat Harry Mudd for trying to cut in on his action. 2. The Federation would have to attempt to liberate any ship named "Slave I"
1. Picard pilots the Enterprise through asteroid belts at one-quarter impulse power --- Han Solo floors it. Luke and Obi-Wan are in a Chinise restaurant and Luke's having trouble. Finally, Obi-Wan says, "Use the forks, Luke." Suddenly in the middle of the fight, Darth Vader pulls Luke to him, and whispers "I know what you're getting for Christmas!" "It's true Luke, *breath* I know what you're getting for Christmas." Luke tries to ignore this, but tears himself free, screaming "How could you know this?!" Vader replies, "I felt your presents." Two Gamorrean guards are walking down a narrow, deserted canyon when suddenly a Krayt Dragon comes out and starts chasing them. One of the Gamorreans stops to put on his best running shoes. "Don't waste time," shouts the other one, "you can't outrun a Krayt Dragon with those!" "I don't have to outrun the Krayt Dragon," says the first one as he finishes lacing his shoes, "I just have to outrun you!" "What's the difference between a lightsaber and a blaster?" "You'd be a fine one to send after my lightsaber." Yoda and Obi-Wan walked into a bar and bought a 5 dollar drink. Yoda, seeing that he only had 4 dollars asked Obi-Wan, "Have a dollar do you? A little short I am." One says to the other, "Did you beat the Wookiee at Dejarikk?" And the other answers, "Yes, but it cost me an arm and a leg." One day Luke gets fed up with life as a farmer so he goes to see Old Ben the local magician. Luke: Ben I'm really fed up being a farmer can you turn me into something else? Luke: Well I guess it would be cool to be a Dewback. Ben: Ok but only if you're sure. Luke: I'm sure all right but let me go off and have one last drink as a human. Luke goes off to have his drink. Owen and Beru are getting worried so they go and see Old Ben to see if he knows where Luke is. Owen: Hey, Ben, have you seen Luke today? Ben: Yes. He's gone for a drink but he won't be Dewback until later. Q: When did Anakin's Jedi teachers know he was going bad? A: In the Sith Grade. Q: What do you call a Sith who won't fight? Q: How is Ducktape like the Force? A: It has a Dark Side, a Light side and it binds the galaxy together. Q: What's the differance between an ATAT and a stormtrooper? A: One's an Imperial walker and the other is a walking Imperial. Q: How many Sith does it take to screw in a hyperdrive? A: Two, but I don't know how they got in it. Q: What goes, "Ha, ha, ha, haaaa.... AGGGHHHH! Thump"? A: An Imperial Officer laughing at Darth Vader. Q: Why should you never tell jokes on the Falcon? A: The ship might crack up. Q: Which Star Wars character works at a restaurant? Q: Why do Doctors make the best Jedi? A: Because a Jedi must have patience. Q: What did the rancor say after he ate a Wookiee? Too funny. I found this at Squidoo! Those of you sensitive geeks out there who can't stand for Lucas' kingdom to be poked fun at, find yourselves a new hobby. Today's video is, OF COURSE, Weird Al. How could it not be with this topic? Woohoo! :D I'll have to pass these on. Remind me to tell y'all about Star Wars: In Concert when I come visit for Thanksgiving. The men in this house have been obsessed with Star Wars from day one, so I'll have to send this to them. Thanks! We love some Star Wars around here and it is so fun to pass on the obsession to our offspring! We just painted Aron's room and it is going to be Star Wars themed when we are done. Gonna mount his light saber to the wall above his bed and everything! 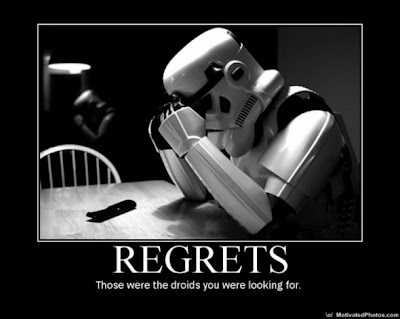 And the 'Regrets' with the storm trooper who let the droids go by is my favorite Star Wars joke!